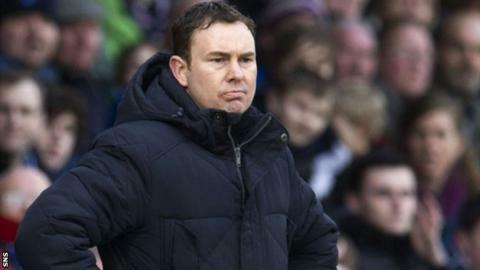 Ross County manager Derek Adams classed his touchline dispute with Inverness CT boss Terry Butcher as "a nice wee exchange". It occurred in the first half of a goal-less Highland derby after County's Iain Vigurs challenged David Raven. "It was a nice wee exchange," Adams told BBC Radio Scotland. "He's a passionate guy and so am I and we're fighting for both sides. There's no problems between the two of us, it's all good." County have now gone five games without conceding a goal and currently sit fourth in the Scottish Premier League. "We're delighted," said Adams. "Inverness are a side who have scored a lot of goals this season and to continue that run has been excellent. "We're 10 games unbeaten now and we've taken a point today from a team who have done exceptionally well this season. "They sat in a wee bit at times and that was testimony to us. But neither team opened up each other. "It was a good game for the Highlands and I think Inverness will be happier with the point because they're away from home." One other major talking point in the game was an Inverness CT penalty claim. Caley Thistle's Graeme Shinnie went down in the box after a challenge from Greek defender Evangelos Ikonomou, but referee Steven McLean booked Shinnie for simulation. "I didn't think it was a penalty," Adams added. "I thought it was a dive from Shinnie and that's obviously what the referee saw as well because he booked him."